In honour of Earth Day, Saher Lalani highlights the staggering amount of food that is wasted globally each year. Check out these tips on how you can help change this. One beautiful summer morning, I took to the trails for a nature walk. I soon found myself absorbed in the sights and sounds that surrounded me: the melodious chirping of birds, a gigantic mulberry tree, dazzling sunflowers. Sadly, in midst of this splendour lay a pile of food waste - half-eaten hamburgers, fries, wrappers and empty soda cans - blemishing the beauty of God's creation. All major religions hold the environment as sacred, and teach humankind to respect and care for it. According to the Holy Qur'an, humans are the highest form of God’s creation and are held responsible for the wellbeing of our planet. We can consume what we need, but we must do so in moderation: “O Children of Adam! Look to your adornment at every place of worship, and eat and drink, but do not be prodigal. Lo! He loveth not the prodigal!” (7:31). Clearly, we have responsibilities toward the Earth and the use of its resources, yet we live in an era of colossal food waste. According to the Food and Agriculture Organization, approximately one third of the food produced globally is lost each year, which amounts to roughly $990 billion of waste. Per capita, consumers in Europe and North America throw away between 95 - 115 kilograms of food per year. Compare that with consumers in Sub-Saharan Africa, South and South-East Asia, who each dispose of 6 - 11 kilograms of food in a year. Food, water and air are the building blocks that nourish our bodies - without them, we would cease to exist. 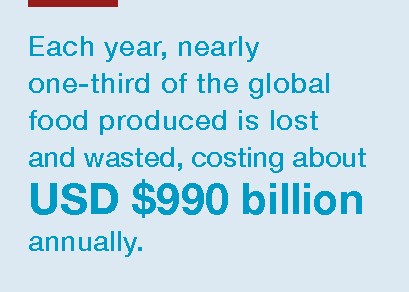 These statistics on global food loss and waste are alarming and should serve as a call to action. Earth Day was established in 1970 to raise awareness about the impact of human activity on our planet. It is celebrated every year on 22 April in over 190 countries, encouraging millions of people across the world to conserve Earth’s limited resources and support its long-term sustainability. This Earth Day, let’s find ways to consume food more responsibly and be more careful about the resources we use so that we can begin to reduce our staggering levels of food waste. See the accompanying tips on how you can start making a difference today. Food and Agriculture Organization of the United Nations, Key facts on food loss and waste you should know!